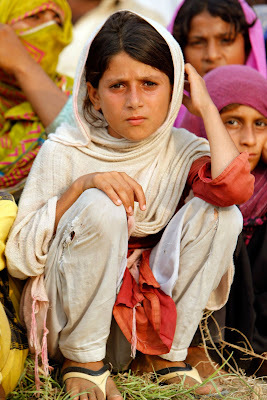 August 16, 2010 /PN/ The death toll is up to 1,463 from floods that have affected millions in Pakistan, more than 895,200 houses have been damaged, more than 2,000 people have been injured, more than 683,000 people have been rescued, and t least 36,000 cases of acute watery diarrhea have been reported, according to Pakistan's Disaster Authority. According to ReliefWeb.int, more than two dozen countries, organizations and individuals have pledged about $305 million. Victims of the worst floods to hit Pakistan in several years walk through water-filled streets in the northwestern city of Nowshera. 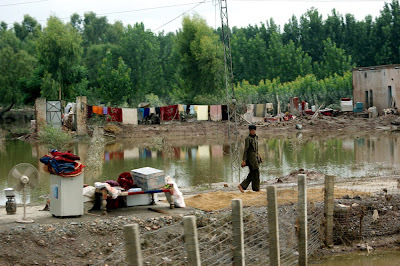 The flooding caused by monsoon rains has claimed up to 1,400 lives and affected 2.5 million people, including Pakistan's large population of Afghan refugees. Victims of the worst floods to hit Pakistan in several years are pictured with some of their belongings in the northwestern city of Nowshera. The flooding caused by monsoon rains has claimed up to 1,400 lives and affected 2.5 million people, including Pakistan's large population of Afghan refugees. 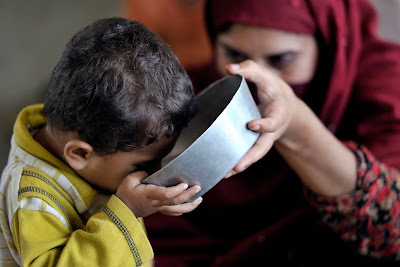 A mother gives her child a bowl of clean water in Charsarda District, in Pakistan's northwestern Khyber-Pakhtunkhwa Province, an area severely affected by monsoon floods. The United Nations Children's Fund (UNICEF) is providing safe drinking water to flood victims in accessible areas of the province. 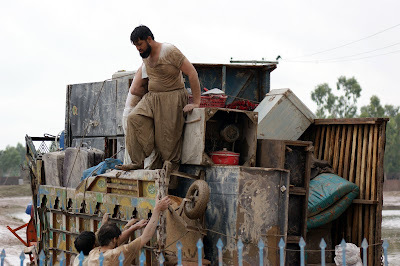 Victims of the worst floods to hit Pakistan in several years load a truck with their belongings in the northwestern city of Nowshera. 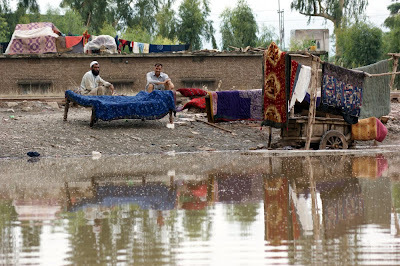 The flooding caused by monsoon rains has claimed up to 1,400 lives and affected 2.5 million people, including Pakistan's large population of Afghan refugees. 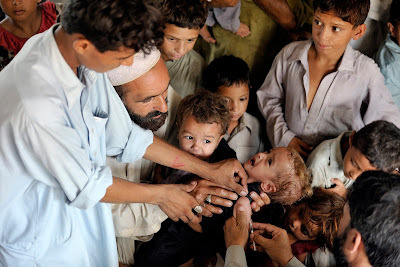 A child grimaces as he receives a measles vaccination at a school in Charsarda District in Pakistan's northwestern Khyber-Pakhtunkhwa Province. The school is housing thousands of people displaced by heavy monsoon floods. 14 million Pakistanis have been affected by the disaster, including many women and children at risk of water-borne and other diseases. 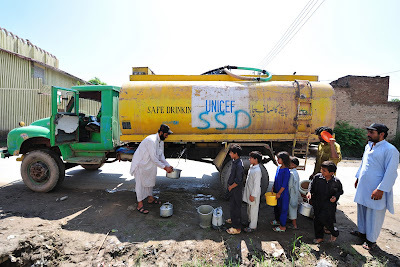 Men collect safe water from a tanker truck supported by the UN Children's Fund (UNICEF) in Jala Bela Village, in the northwestern Khyber-Pakhtunkhwa province of Pakistan. Eighty percent of the village's homes have been destroyed by floods, and an estimated 2.5 million of the province's 3.5 million residents have been affected by the disaster. 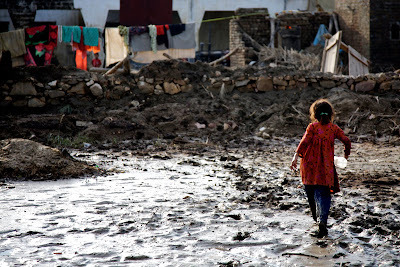 A child walks through a mud-filled street in Khwas Koorona Village, in the northwestern Khyber-Pakhtunkhwa province of Pakistan. An estimated 2.5 million of the province's 3.5 million residents have been affected by severe floods. 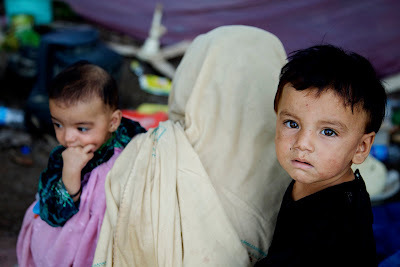 A woman and her two children stand in their makeshift shelter, along a roadside in Pabbi Union Council, in the northwestern Khyber-Pakhtunkhwa province of Pakistan. Their home was destroyed in the floods that have affected an estimated 2.5 million of the province's 3.5 million residents. 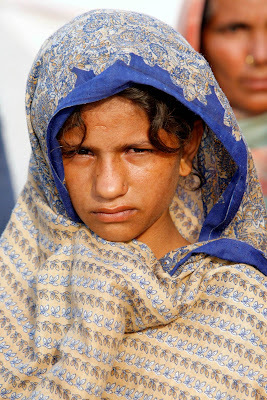 A portrait of a young girl in Sultan Colony, an encampment of people displaced by Pakistan's potent monsoon floods, in Punjab Province, near the city of Multan. 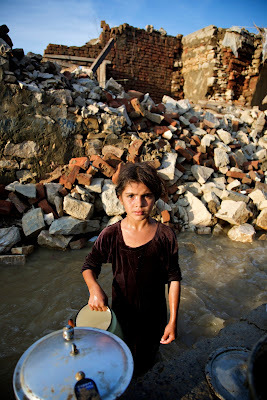 Eight-year-old Amreen washes dishes in rainwater, in Khwas Koorona Village in the northwestern Khyber-Pakhtunkhwa province of Pakistan. A destroyed house stands behind her. An estimated 2.5 million of the province's 3.5 million residents have been affected by severe floods. 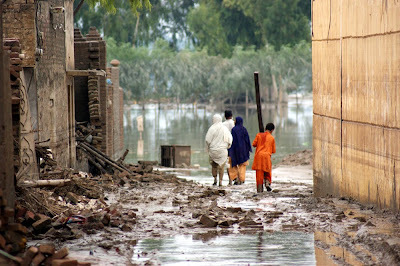 A man walks past a stack of personal belongings along a flooded street in the northwestern city of Nowshera, Pakistan. 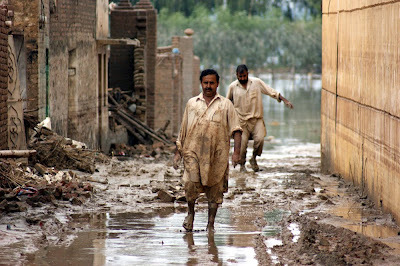 Pakistan's severe floods, caused by monsoon rains, have claimed up to 1,400 lives and affected 2.5 million people. 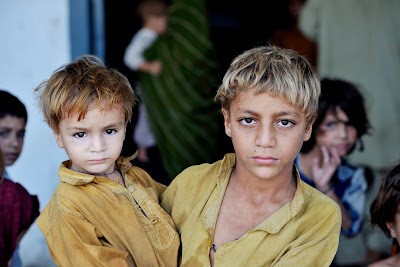 A boy holds his younger brother in front of a school housing thousands of people displaced by heavy monsoon floods, in Charsarda District, in Pakistan's northwestern Khyber-Pakhtunkhwa Province. 14 million Pakistanis have been affected by the disaster, including many women and children at risk of water-borne and other diseases. 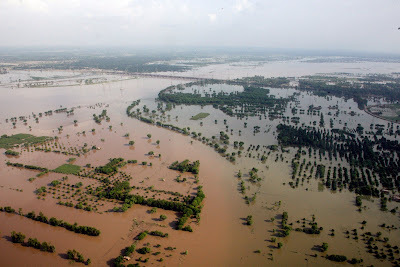 A view of heavy flooding caused by monsoon rains in Punjab Province, near the city of Multan, Pakistan. You can help the flood victims by donating to any of the organizations listed below and/or by sharing this info to anyone who could help. poor them. i wish everyone donated $1 to people in disaster areas. their life would change dramatically. Lets come to India, we have enough space in our homes, food, job, and unconditional love for you ppl. May allah wipe this disasters by this Eid. People ,here, are still struggling for survival, let alone progress. I pray to God, that may all the affected families and individuals get over all of this and may they live well and their children get all the opportunities they deserve. May none of these affected children end up in child labor. Conditions don't look good, neither the future. People must realize the need of a huge humanitarian efforts, great steps and well leadership. We all must focus on this greater cause and must donate in every way we can, even a smile to the affected will be a great donation, a hug, a word of inspiration and courage build up.